Review copy from the author, thank you! There are two contemporary Tudor novelists that I really enjoy and who I would not be adverse to reading their fifth or sixth book set in the era. Otherwise, a Tudor book by any author would not cross my threshold as I have had my full of the whole Henry VIII and Anne Boleyn episodes. With D.L. Bogdan's newest Tudoresque novel we are treated to a historical figure that always seems out of England/out of mind in my reads: Margaret Tudor, elder sister to Henry VIII and the favored Mary Tudor, Queen of France who later married Charles Brandon. Margaret's story may not be too different than other royal princesses as they are marketed to the best match for their country and off they go, never to return to their homeland again. Margaret was sent by her father Henry VII to go make peace with Scotland and marry their King. That is what she attempted to do, and her marriage was portrayed lovingly and I enjoyed reading their story. There was always a constant struggle for Margaret, was she a princess of England or was she a Queen of Scotland? Margaret herself came off as naive, petulant, somewhat wild in nature, and wholly unpredictable. Which made the reading that much more fun (except when sometimes I felt like I was reading about Mary Queen of Scots! SO similar in character!)! When we got to the parts where Margaret lost so much, I really empathized with Margaret that I was able to forgive her arrogant ways and horrible marriage choices. Her losses were many, and she seemed to stack up more losses than her counterparts such as Catherine of Aragon or even Anne Boleyn. And yet, we always hear SO MUCH more about Catherine and Anne. Due to Bogdan's captivating storytelling, I am more intrigued about Margaret Tudor, mother of King James V and eventual ancestress of the United Kingdom. 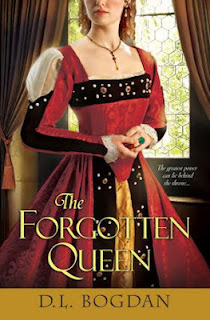 I recommend The Forgotten Queen for its quick pace, and for doing Margaret justice. Why she should always seem to be forgotten in novels and history is a mystery and a travesty for a woman who went through so much and ultimately gave so much to Scotland yet was not recognized for it. As I read through Bogdan's telling of Margaret's story, I felt her pain as she yearned for love and appreciation, and she finally achieved it with this reader.